EasyJet passenger punched by Nice Airport worker. Image taken by fellow passenger, Arabella Ark. Disconcert follows after an EasyJet passenger punched by Nice Airport worker: The devolution of the flying experience continues in the latest airline/airport fracas. 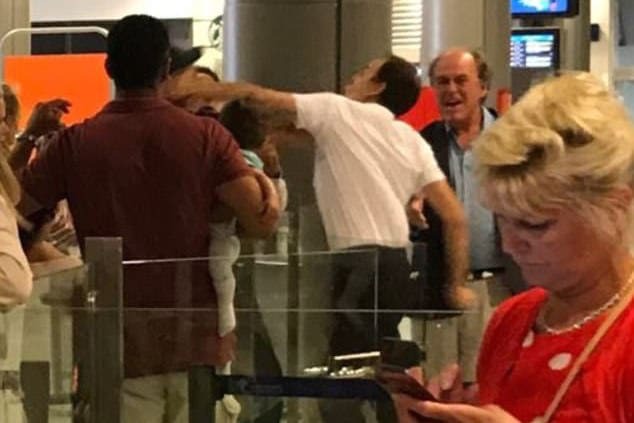 An EasyJet passenger has been photographed being punched by a Nice airport worker, after a 13 hour delay led to the escalation of tensions as passengers waited for news on their Nice flight to Luton, UK. The incident happened as the un-named British passenger in his late 20’s had presumably complained about the long delay in boarding the flight, when suddenly he was struck by a Nice airport worker. At the time the struck passenger was holding a child when he was struck across the head. The shocking incident happened Saturday as passengers waited to board EasyJet flight EZY2122 from Nice to London Luton. Told witness and fellow passenger Arabella Ark, 49, who was with her children at the time, and who had snapped the image via the dailymail, ‘He was standing there holding his nine-month-old baby. He didn’t want to have a fight. ‘The worker just smirked at him and he was the other side of the glass barrier so he reached over to hit him. ‘It was awful the whole thing. I just can’t believe people can behave like that’. Arabella claimed her husband, 64, had to pull the airport worker from the man. Reiterated Arabella, ‘He said nothing, smirked, showed no interest or concern for the family,’ she recalled. Another passenger by the name of Carl later told the dailymail, that the struck man had simply approached the desk to raise concern about the lack of air conditioning and concern for elderly passengers and children. That said, video footage released via the Sun showed the young father inciting violence after pushing the French airport worker before the man retaliated in kind. Just seconds before, the footage showed the worker try and knock a camera phone out of the British father’s hand when he attempted to take a picture. Police now intend to speak to both of the men in light of the new video and seek to analyze CCTV before taking action. 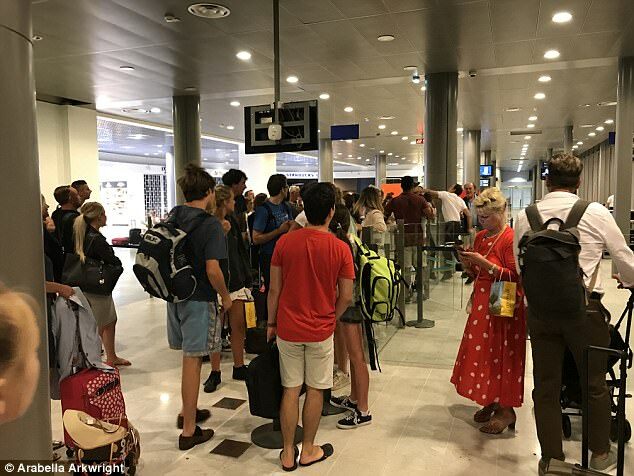 EasyJet passenger punched by Nice Airport worker: Arabella Arkwright was at the airport and took the photograph of the man in the white polo shirt (pictured) appearing to punch the British passenger. A report via cnn told of police initially taking the abused passenger away, (along with the infant), only for the father to return for the plane’s eventual takeoff. Told Jean-François Guitard, a director at Nice airport, ‘We had a serious problem with someone of staff from our subcontractor Samsic’. According to Guitard, the father had complained about the EasyJet delay to a Samsic employee. Unable to answer the passenger’s questions, the employee suddenly lashed out with a punch. The specific Samsic employee was understood to be suspended shortly after the incident. The worker is understood to work for special assistance provider Samsic who are contracted by Nice airport. Responding to the fracas, an easyJet spokesperson said the airport employee did not work for the airline. The airline went on to apologize for the flight delay, which it said was due to a technical problem. Another aircraft had to be flown over from London. Continued the budget airliner, ‘Passengers were provided with updates and refreshment vouchers during this time and the flight landed in London Luton last night’. Commentators on the web have since singled out the budget airliner for having adopted practices and measures pitting first arriving passengers vs later arriving passengers who subsidize such travelers and other measures, including the use of automation machines to keep a lid on EasyJet’s expenses and maintain its profit margin. While others pointed out what they deem the dismissive attitude of French airport workers who are used to ‘going on strike’ and who have little tolerance of travelers…. Welcome to a brave new world of the ever evolving friendly skies ….